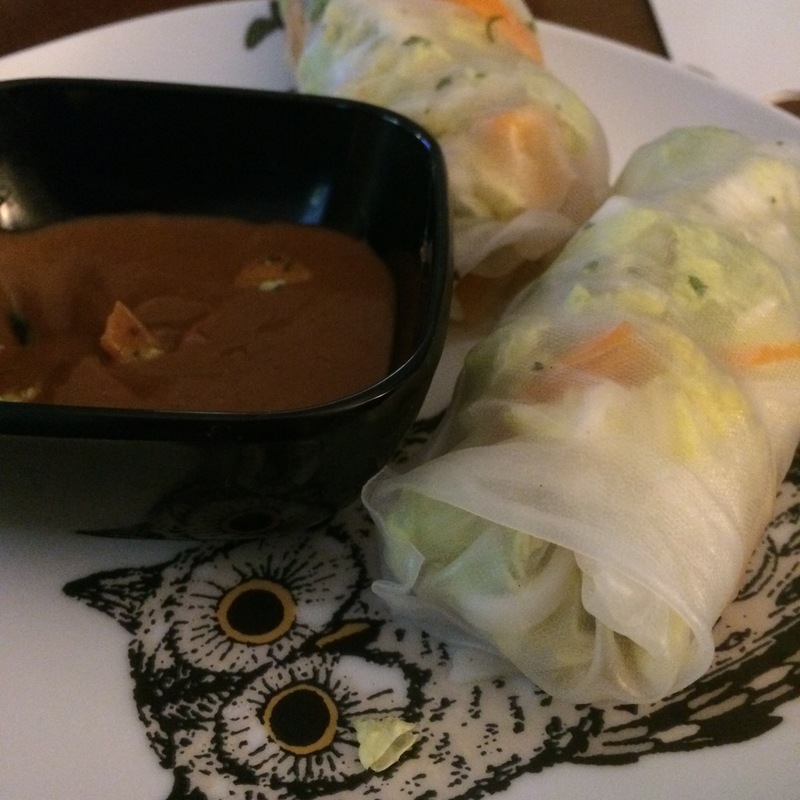 Vegetarian protein and salad in a rice roll with a peanut lime sauce… yes, these are seriously amazing and seriously healthy. These took a while to make, working with the fragile wrappers, but they are oh so worth it. The rolls themselves are crisp and refreshing and light, and the peanut lime sauce is rich and packed with flavor and almost decadent. I highly suggest using a food processor with a large grater attachment for the carrots and cabbage- it makes life so much easier. If you rip the rolls a little bit during assembly or your rolling skills aren’t perfect, please don’t worry about it. These rolls are incredibly delicious no matter what they look like! You should go make these right now. This recipe was adapted from delishknowledge.com. Combine all ingredients for the peanut lime sauce in a bowl and mix. Heat the oil in a large skillet over medium-high heat. Cut the rinsed and pressed tofu block into 12-15 slices (one to lay flat in each rice paper roll). When the skillet is hot, add the tofu slices and cook 2-3 minutes per side, until golden brown. Remove the slices from the skillet and add a thick layer of the peanut lime sauce on the top of each slice. In a bowl, combine the napa cabbage, carrots, cilantro, and mint. To prepare the rolls, heat (to very hot but not boiling) about an inch of water in a skillet large enough to hold a rice paper wrapper. Place a wrapper in the skillet for about 15 seconds, then carefully remove (I did so using a large spatula), transfer to a clean surface, and spread out as much as possible. It’s okay if the wrapper rips a little bit. On the bottom third of the wrapper, layer the tofu (sauce side down), noodles, and cabbage carrot mixture. Gently fold over once, tuck in the edges, and continue rolling until the seam is sealed (just like making a burrito). Place seam side down on a serving platter and cover with a damp warm towel to keep fresh. Repeat to create remaining rolls. Serve with remaining peanut lime sauce.